Praising in the midst of our struggles, before any breakthrough in our lives, is often unfathomable and most of the time unrealistic- how can you lift your hands and sing worship to God when there’s so much pain and despair around. Yet this is the heartbeat and the main message of Bryan & Katie Torwalt’s newest EP Praise Before My Breakthrough. One of the mainstays and veterans on Jesus Culture, this husband and wife duo have wowed us before, with songs like “I See Heaven”, “Shores”, “When You Walk Into The Room”, “Mountain”, “Let There Be Light” and “King Over All The Earth” to name a few- yet it is only now that I have stepped out and intentionally listened to their music. Sure, I’ve listened to a few songs on Spotify, but Praise Before My Breakthrough is my first release of theirs that I have fully listened to, for one reason or another. And what is my assessment, after listening to this EP twice, three times, numerous times? Well, it’s pretty good, and totally wrecks you when you fully understand the concept of worshipping in the midst of trials and tribulations. Sure, we have “Blessed Be Your Name” from Matt Redman, but these songs are quite remarkable and will definitely have us entering into much healthy discussion in the coming days, weeks and months. “My Hallelujah” starts of proceedings and is the heartbeat of the project, as Katie leads this melody with aplomb and professionalism, ardently stating that nothing can take away her fervent praise to Jesus- not even darkness, not even death, not even the most difficult time ever. Reminding me of Romans 8:38-39, and then extrapolating that from ‘nothing can take away God’s love’ to ‘nothing can take away our praise to Him’; Bryan and Katie have recorded a real emotional and hard hitting anthem here, as we dwell upon and ponder the weight of who God is, leading us to worship Him in any and all circumstances. Musically a mid-tempo guitar led radio friendly track, “My Hallelujah”, though lyrically cliché at times, is one of my favourite songs of 2018, and I’m sure will resonate with others perusing this song as well. The rest of the short but punchy EP delves into a whole manner of topics that haven’t really been sung in depth over the years. “Be With Me” essentially asks God to be more present in our lives (or at least to make us more aware of his active presence in each of us! ), with Bryan leading this song, and sounding eerily similar vocally to Chris Llewelyn of Rend Collective; while the 6 minute somewhat imposing piano led title track, another favourite of mine, emphatically and authoritatively relays to us that because of what Jesus has done in the past, we can worship Him before we ever tangibly have evidence of the victory- as a song this melody is one of the most vulnerable I’ve heard this year, and should be the first song listened to in full by others on this EP…actually from Bryan and Katie’s entire discography! The acoustic guitar led “Arms Of Grace” is next, as Bryan majestically imparts to us the notion that we can always run back home into Jesus’ arms- the arms of grace; while the EP ends with the beautifully sung and compelling mid-tempo anthemic ballad “Prophesy Your Promise”- where Katie makes known the realisation that even though we aren’t sure about the future, we can indeed speak out with confidence and prophesy Jesus’ promise to the world and to our friends and family. Because we know that He is true and He is faithful, Jesus’ promises hold weight and significance, and therefore declaring something over someone that we’re unsure about on our own, but confident in Jesus; is something that shouldn’t be uncommon, but rather encouraged. For if we are Christians, why don’t we act in faith and declare things not seen yet? Jesus is coming, so let is shout it from the rooftops and the mountains. 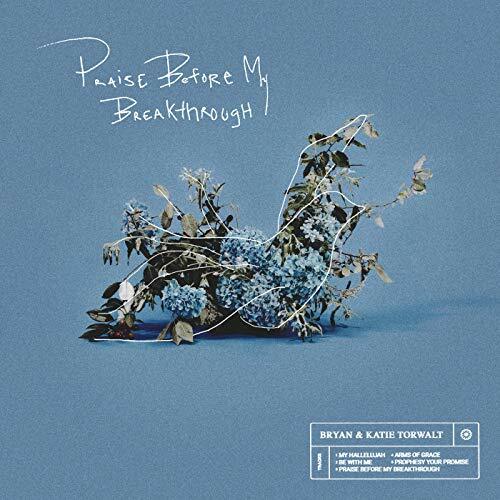 The only downside to this EP is that Bryan & Katie Torwalt’s Praise Before My Breakthrough is too short, and doesn’t really contain many upbeat songs, if at all. Yet this is just a nitpick, as for me listening to Bryan and Katie compels me to investigate the rest of their discography. No doubt you’ll be inspired to check them out also. With both husband and wife at the top of their game here, sky’s the limit for these two. So what are you waiting for? Let us all declare praise before our breakthroughs, and let us be changed by one of the more hopeful and impacting EP’s I’ve heard this year!